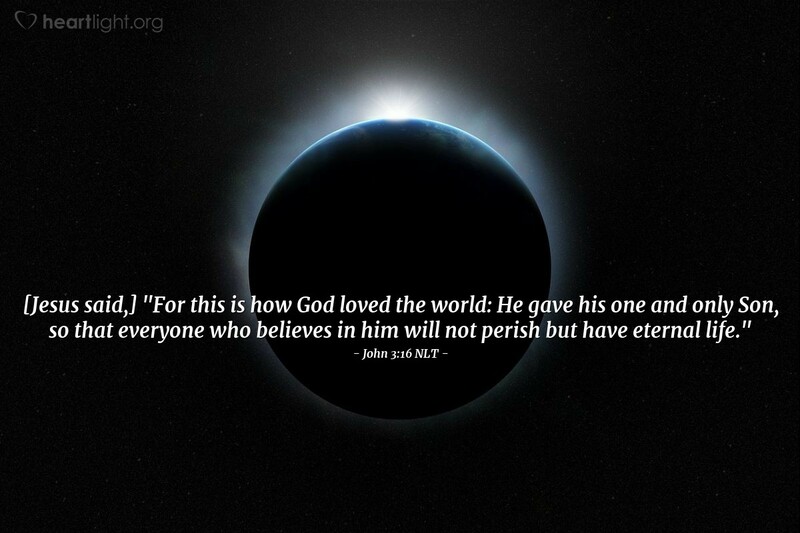 [Jesus said,] "For this is how God loved the world: He gave his one and only Son, so that everyone who believes in him will not perish but have eternal life." God loves us! That is the triumphant message of the Bible. That is the greatest message we will ever receive. Thankfully, however, this is not just a message in words. God wanted us to know his love for us, so he demonstrated that love at great personal cost. God loves us! We know that because he gave his Son for us. God loves us! He didn't want the power of "perish" to claim us, so he gave us the power of his love. God loves us! He sacrificed so we could have life. God loves us! Don't ever doubt it. Don't let the evil one rob you of this life-giving truth. God loves you and wants to give you life! Father, I believe that you gave Jesus to save me from my sins. I confess that I cannot fully understand that love, but I thank you and praise you with all of my heart. Please forgive me when my life does not reflect your loving evaluation of my worth. Give me the strength to believe what you say about me and what you have done for me. I place my full trust in your love to continue its transformational work of redemption in me. Thank you that you are making me better than I am right now. Thank you even more for ransoming me from my sin and giving me life with you. In Jesus' name. Amen.